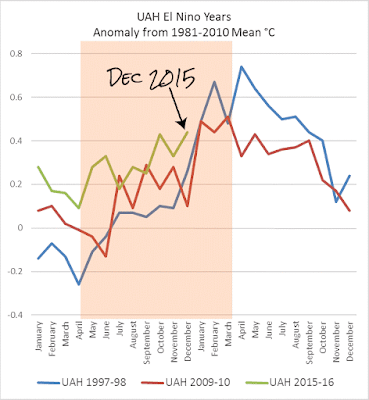 Data source: UAH and Roy Spencer's blog. Yeah but that was Ver 6.0 (The Forcing Awakens). Ver 7.0 will fix the obvious glitch. Denialism as a political philosophy is now melting fast but not fast enough to affect November's presidential election. Denialism is baked into the primaries and all current GOP candidates are determined to ceremonially ditch the COP21 agreements unless Mitt Romney is parachuted into the Republican National Convention. For all our sakes lets hope that if the uglies get hold of the White House, Mitt Romney (R. slightly ugly party) is the occupant. PG, one of the blog articles I've started work on is about this topic. It's interesting, but big. No promises about when or if it will be posted, but I'm learning more doing the research. That is, on decision-making and policy development/response, not ice ages, if I need to say that. A topic that I use in my other life, too. Judith is just so far wrong and so out of step with *all* serious thinkers and policy analysts, not just Nassim Taleb. She demonstrates no capacity for logic or rational thought or research on the subject. But then she doesn't demonstrate any such capacity on any topic these days. It's meaningless slogans and non sequiturs all the way down with Judith. Did King David build the pyramids to store grain? Will Georgia Tech allow me to supervise any more PhDs? Spot on, PG. If only Judith could figure out whether she is interested in maintaining a thriving human civilization, or if she is merely thinking it might be an idea to have some form of life on earth survive, to kick start evolution again after the sixth major extinction. I don't think it gets that hot in Atlanta. Still, you'd think that as a climate scientist she'd know that a rapid rise in mean global temperature of 4C to 6C or more (up to 11F or more) would be as threatening as a similar drop in global mean temperature. Not to mention the ludicrousness of suggesting that an ice age is on the cards any time soon. Sou In order of importance these are the most important outcomes from doing science. Judith doesn't suffer analysis paralysis, she can't even make it to the analysis stage. Exactly. Why on earth did she sign off on Nic Lewis's TCR paper if she thought that 1200 ppm would be just tickety-boo and what the hell does Nic now think about his (wink) co-author? There are two new articles on climate sensitivity by Gavin Schmidt at realclimate.org. It's about the recent paper by Kate Marvel (what a great name:D) and co. I think ATTP has written about it too. It points out some of the problems with taking a simplistic approach like the one Nic Lewis takes. Joseph! Of course. MY BAD. I tried to send a letter of apology to Carson's Campaign Manager but it was returned "NOT KNOWN AT THIS ADDRESS" and yes it was all in upper case. So Dr Curry is playing the "ice age cometh" card. Honestly, when in a very deep hole don't dig. @ Mr. Scholar: a scientific reputation takes many years and much work to build, but not quite so long a time to tear down if someone really sets his or her mind to the task. There is a widespread tolerance for emeritus professors and retired researchers who haven't kept up with developments in their field, thought they don't garner nearly the respect as do those who stay sharp and current into their 70s and 80s. However those who insist on talking nonsense in public as well as bad-mouthing the integrity and competence of their colleagues or former colleagues, particularly when their own is deeply suspect, will properly find their past reputations carry no weight at all. If Mr Scholar wants to repeat his/her comment and address it to me properly (as Sou), he or she can do so, even riding his or her high horse. He/she has posed some very good questions (eg how the heck did Judith get to be a Professor, given she blogs such nonsense?) but the conclusions do not follow. I am sorry that my comment upsetted you so, Sou. Dr. Curry's statement makes sense to me. Climate change is not uniform over the globe, I mean, just look at NOAA's map of temperature rise since 1901 through 2011: https://en.wikipedia.org/wiki/Instrumental_temperature_record#/media/File:NCDC_temperature_trend.png Would you like to tell me, Magma and Sou, what is so absurd about it? What makes it nonsense? Judith was a professor and chair at GT, I believe, because she is (or was, in your views) a respected climate scientists. As simple as that. She was on the NRC's Space Studies Board, as well as the Climate Research Board. She's a fellow of the AAAS, the AGU, and the AMS, from which she has won the Henry G. Houghton Award: https://www2.ametsoc.org/awards/search.cfm. Where has she bad-mouthed the "integrity and competence of" her colleagues? I understand her "past reputation" (though several things I listed are from now or recently) carries no weight with you, but take a step back and think about it. Would her study with Nic Lewis be in Climate Dynamics if she was that disrespected? How about her comment on Mann et al. 2015 in Science? Excuse my typo, I meant to say "climate scientist". Mr. Scholar: Where has she bad-mouthed the "integrity and competence of" her colleagues? I'll start. She is an admirer of Mark Steyn, a professional denier who trades in deception and defamation of scientists. Where does she admire him? A professional "denier" of what? I may know what you would consider answers to my questions, but I want to hear it from you. even if what you say is true, that doesn't make her a bad-mouther of the integrity and competence of her colleagues. Richard Lindzen is the one that bad-mouths his climate science colleagues. Google the "Lindzen Paradox"
Lindzen was getting hammered at the AMS meeting today. Mario Molina sarcastically calling him a "a very special person" and suggesting MIT should dissociate from Lindzen, according to a @climatebrad tweet. Dr. Lindzen may be right, or he may be wrong. I won't judge if climate scientists are academically inferior, but he probably should've been more tactful in his opinion-giving. It is just that: his opinion. Dr. Molina may make fun of Dr. Lindzen and suggest whatever he likes, but that doesn't change anything about Dr. Lindzen's claims above or his scientific arguments. Mr Scholar, it takes a lot more than rudeness from an unknown blog commenter like yourself to upset me. As for your defense of Judith, either you are not familiar with what she's been up to, or you're a fan. Judith has been badmouthing her colleagues at least since 2010 when she came out as a denier/disinformer. She has misled the US government at their committee hearings on more than one occasion. She blogs a lot of nonsense and publishes nonsense from other deniers on her blog. She thought it was going to be a "treat" to be in the same room with Mark Steyn and Ted Cruz! She advocates against mitigation. You can't tell what a person has been doing outside of their publication history and bio just by reading their publication history and bio. Do a search using the search bar up top. Or read her blog. Or read her testimony to the US government. You can start here for some of her recent history - which contains some links. BTW that isn't an NOAA chart. It was Giorgiogp2's own work on Wikipedia - based on NOAA data (according to the web page). I don't see anything much wrong with it. 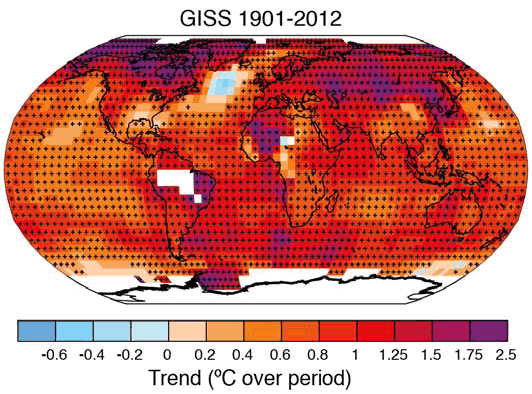 Here is the IPCC trend map using GISS data. Go off and do your own research about Dr Curry and the issues with her political ideology. She may well be the smartest person on earth but that is irrelevant, it is what she does and says on the public record that counts. I suspect you already know this about Dr Curry; but you would love to waste other's time by getting them to do the research, won't you? I don't agree with Judith saying " the risk of climate change is an aggregate of the risks faced by individual regions". There is also a world-wide risk, meaning that the risk as a whole is greater than the sum of the risks of the each different region or nation. Think massive migrations, civil or international war, infrastructure damage affecting world trade etc etc. as a matter of fact, I am familiar with "what she's been up to", and I am not a "fan" of her. I accept that humans can cause climate change, and my position is best summarized in Hypothesis 2a of this article in Eos by Pielke Sr. et al. (every author is a fellow of the AGU, http://personal.cege.umn.edu/~foufoula/papers/efg_107.pdf). As for this "bad-mouthing", though it may indeed be that, it seems to make sense to me. A liberal administration would want scientists working for it to come to desirable conclusions, conclusions that would benefit the administration politically, and so politics may have some influence on climate research, though this is speculation from me. Judith is perfectly willing to accept "real scientists" doing "real science", but she has a right to disagree with their conclusions and a right to comment on what is wrong with President Obama's position. I believe that she was referring to the IPCC's position that extreme weather events have not increased statistically significantly over the 20th century. Her comment on "climate change is real" is spot on as well. The Cook et al. paper has been criticized in the peer-reviewed literature four times, as of now, and I don't care how many awards it won, that doesn't make it valid: http://www.wmbriggs.com/public/Legates.etal.2015.pdf, https://www.heartland.org/sites/default/files/cook_consensus.pdf, https://www.scribd.com/doc/273901252/Quantifying-the-Consensus-on-Anthropogenic-Global-Warming-in-the-Literature-Rejoinder, http://iopscience.iop.org/1748-9326/10/3/039001/pdf/1748-9326_10_3_039001.pdf. Her 2010 comment also seems reasonable. "The stagnation in greenhouse warming observed over the past 15+ years demonstrates that CO2 is not a control knob on climate variability on decadal time scales"
I can't find anything very wrong with that statement. I would say it is an oversimplification to call CO2 a control knob at all, and on decadal time scales certainly not. It is more complex than just a control knob. And you must consider that last part: on decadal time scales. I think that CO2 effects may be more significant in the long term than simply in one decade, though the effect is obviously still there. What's wrong with thinking it a rather neat experience to be in the same room with people you have heard so much about, even if you don't agree with them? Mitigation may not be our best option, and Dr. Curry recognizes this. Adaptation may prove to be more successful. (I will try to add evidence to part later but I would like to finish this comment). Personally, I would rather not like to search your blog or follow your smears on Dr. Curry because I think they are unwarranted and I don't consider this blog to be a reliable resource. What she said about an ice age also makes sense-cold is known to cause more deaths than warmth! I know that if we were to get an ice age coinciding with a 5 degree rise they would balance each other out, and I believe Dr. Curry does to. Notice also that she said "arguably". And this "on pace for 5 C and the fastest rise" stuff depends on your climate sensitivity, which has been estimated as lower than the AR4 several times recently (same thing as with mitigation-I shall try to back this up later). Excuse me for the misstep. It is indeed a chart of NOAA data. I apologize for not being more clear (and that earlier apology wasn't meant as an affront). Harry, I am not trolling. I simply want to hear it from you-what you think is so terrible. I don't want to waste anyone's time, ok? You may not agree with that, but it seems reasonable to me. If you add up the regions of the world, you get the whole world. Of course there could be a world-wide risk, but that is, as she says, an aggregate of the risks from individual regions. You could factor in those things you listed to the regional risks, actually. About her not being as prolific anymore, I think that may be because she is busy with her blog. "As for this "bad-mouthing", though it may indeed be that, it seems to make sense to me. A liberal administration would want scientists working for it to come to desirable conclusions, conclusions that would benefit the administration politically, and so politics may have some influence on climate research, though this is speculation from me. Another conspiracy theorist rears his head - as if scientists make a habit of fiddling their research results to please a president. Sheesh. (They don't of course, It would quickly be shown up by their colleagues all around the world. There are climate scientists outside the USA don't you know. And have Republican presidents wanted global warming any more or less than democrats?) No president of sound mind wants to have to deal with global warming. Responsible people know they have to. Irresponsible people spread disinformation about it. Anyway, if you're familiar with Judith's disinformation antics, what are you complaining about? Just trolling? Wanting someone to post the evidence on this thread? That's what the search bar up top is for. Or you could use Google. As for CO2 not being important on decadal time scales - of course it is. Saying it's not is plain denial. What do you think caused all the warming of the past few decades. PS Five degrees of warming would make parts of the world uninhabitable, exceeding the tolerance of mammalian physiology for at least some of the year. However it's not just the number of deaths directly related to heat waves (like the ones that killed tens of thousands in Europe in 2003, and India last year), compared to the number who die from the flu in winter, it's the impact on droughts, floods, fire, famine, civil unrest, infrastructure, sea level rise etc etc. It would be every bit as disastrous as a big ice up - not just a Little Ice Age but a big one. I cannot understand people willing to kid themselves that global warming isn't a problem. It's grossly irresponsible to reject the best evidence the best minds provide in favour of what some denier blogger waffles on about. Is, where is all the science that underpins that alternative hypothesis? – I am sure we can reject the conspiracy theory nonsense about it all being suppressed, as all that inevitably leads to is Agenda 21, NWO and Global Government claptrap. That is why the studies on consensus are like kryptonite to the contrarian crowd – everyone accepts consensus does not equal right or wrong in scientific enquiry. However, it is a handy illustration to people who simply do not have the time or energy to (in the inevitable words of the Conspiracy Crowd) “do your own research” which in reality is short hand for type “Climate Hoax” in youtube. Mr Scholar because you know Dr Curry better than most, could you help us out? Judith has stated that BEST's temperature series is the most reliable. Knowing her as well as you do, what do you think she'll make of today's press release from her old pal Elizabeth Muller? I am not a conspiracy theorist, I simply said that politics may have an influence on science, as it has in the past. I am not saying that is the case for now and admitted it was speculation. I know that Bush's administration produced reports that supported alarmist arguments, that is why I chose the word choice that I did above. I didn't say it was n't important-don't use strawmans against me. I am not trolling, I am trying to get people on this thread to stop their attacking her and for you to admit she does have capacity for rational thought. That was why I originally stated part of her credentials. Actually, there are numerous arguments for natrual causes that could have driven the recent warming-and I don't think most scientists agree that humans caused all of the warming of the past few decades. Listen, I don't care what you think I reject, but my views are supported by numerous peer-reviewed articles. Maybe my opinion isn't that of the consensus-if there truly is one that CO2 caused most of the recent warming-but it isn't that of a denier or conspiracy theorist. You have a citation for that assertion about a 5 C warming? Anyway, I do recognize that warming could potentially cause some problems, but you act as if it could be just as bad as an ice age. What peer-reviewed literature supports your view? what consensus is there about whether CO2 is a "control knob" on global temps? Of course AGW can explain part of our situation-but there are other explanations, too, contrary to your assertion. I am not claiming any "Climate Hoax", and the well-known "consensus" studies have all been criticized in the peer-reviewed literature. I don't claim to know her better than most, and I am not sure what she will make of it, but it makes sense. This year is the first of what is probably going to be one of the top 3 El Ninos on record. 2016 may be even warmer. She may say most reliable, but perhaps not best (please excuse the usage of the word). Anyway, I do privately ridicule and raise an eyebrow as to what goes on over here, as it were. It's fine, thanks for being so polite. As I again, unfortuantely, seem to be short of time, I must continue this later. >>"and I don't think most scientists agree that humans caused all of the warming of the past few decades." It would pay you to investigate your thinking. Look for evidence. First figure out how many scientists work in attribution studies, then read their published work, then count the number of scientists who have published work showing that it was something other than the additional greenhouse gases that caused most or all of the warming in recent decades, then identify what it was that they found caused it. (That's already been done, as you know, though they didn't examine whether it was 90%, just more than half. You can check it for yourself if you want to. The data is all there.) The current thinking is that it is probably 100% - more than 100% from extra greenhouse gases offset some by aerosols, making it all down to us. Otherwise you are just blowing hot air, and there's already more than enough of that to go around - certainly in my part of the world where we've just had some 40+ C days of weather. Read the IPCC reports - the most comprehensive report of any science in the world, not just climate science. If that's too much, then read the publication below, which was put together by the Royal Society (UK) and the National Academy of Sciences (US) - the two leading scientific societies in the world. It is a lot easier to read than the IPCC report and it will probably only take an hour or so of your time. It was prepared and reviewed by some of the world's leading climate scientists. Read what the experts say, not some denier bloggers. Freeman Dyson is not a working climate scientist and it is well known that he is a climate science denier. There has been a heap more work done in the past 40 years since that paper was written in 1976. You might as well be calling upon Meteorologica for your "opinions". Your "beloved Sonja Boehmer-Christensen" is also a denier. She has said that for her, it's politics. Whatever your reasons for denying climate science, at least be honest with yourself that you are rejecting it, even if you can't figure out why you can't accept it. BTW - climate science deniers are either conspiracy theorists (scientists are fudging the data, it's a hoax, something must be wrong etc), or knowingly disinforming, or not know a thing about climate. Take your pick. If the last - then you need to read up on climate. If one of the first two - take your pick and let us know. I work in IT and you always get the “meh I would not have done it like that” crowd – great but in reality they add nothing – in essence intellectual tyre kickers. The other is the Legates paper – well sorry that has Lord Monkton as a co-author, he is simply a clown, and precedes any lecture with 20 mins of “world government, Marxist conspiracy and Agenda 21” – accepting anything he says would be the intellectual equivalent of a domestic abuse victim returning to the abuser – on the basis that he/she may have changed. Monkton has been caught out so many times it is laughable. So in my view there are no intellectual free passes on this – you either have to accept the general consensus, based on the overwhelming amount of published research – dealing with many many lines of independent but corroborating evidence that the basic science behind AGW is real the effects are being seen and are potentially hazardous (not to the planet btw, it will survive) to humanity. Or you somehow think alternative views/theories are being suppressed. If it's "politics" then there needs to be some proof that climate scientists around the world in all cultures and political systems share their politics to the point of generating the same severe bias in the same direction in their published science in every case. Amazing how "politics" can spread around the world like that! Guess there really is a world govt conspiracy :-o ! Clearly rubbish thinking or conspiracy thinking depending on exact thinking route. But equally wrong in either case. "I work in IT and you always get the “meh I would not have done it like that” crowd..."
Comments were removed because Mr Scholar just dug deeper into a tedious, wrong and long denier defense of his denial (citing such luminary science deniers and anti-science lobbyists as the GWPF and PopTechnology and then has the cheek to try to claim that he doesn't get his opinions from deniers! Huh?). Mr Scholar - you are clearly on the wrong forum. Go back to WUWT or Prison Planet or Judith's place or whatever your favourite denier hangout it. This blog is to demolish disinformation not promote it. and poptechnology, lol that guy gave me an amusing evening looking at his posts, he has been spouting crap over the internet since 2005 - it used to be about browsers!! Now Sou, that rebuttal to the joint academies report was written by 13 credentialed scientists, 6 of whom I would say are well-qualified to speak about such a topic and the rest of whom have studied this issue extensively, if not always in the peer-reviewed literature. It was peer-reviewed, and you simply attack the people behind it! Why not address the report itself? How about that? I have checked the literature (though obviously not in total, that would be quite difficulte) and in fact I was looking through the recent PNAS articles and saw quite a few supporting alarmist arguments, though perhaps one or two supporting skeptic arguments. Dr. Pielke, Sr. is highly credentialed and respected and I have every right to cite him. Why else would he be on the 2013 panel to update the AGU statement on climate change? As for Monckton, though he has made some claims which are unsubstantiated, I can still cite his peer-reviewed papers. You have constantly attacked the people, not the arguments, which I cite. I do not simply dismiss the IPCC out of hand, but I told you that it has been criticized in the peer-reviewed literature 22 times. I gave you four papers-not one, not two, not three-but four papers, not just the paper with Monckton as an author. I have never commented on Prison Planet, on WUWT I have complimented people like Nick Stokes and countered someone who you would consider a denier since I thought they were going too far in their characterizations of the likes of you. If Monckton was that bad, why has he passed peer-review four times in two different journals? Listen, I only cited the PAPERS from PopTech's list, ok? How about you read the papers and then criticize them, instead of attacking the person who compiled them. I wish you wouldn't delete my comments, because those took a while to compile and now no one can even see them! Anyway, will you answer my question I posed before in one of the deleted comments, about the Eos article? Also, peer-reviewed papers (some of which were in the comments you deleted) have come to different conclusions than the IPCC and have been ignored, in fact, the IPCC AR5 WG1 report (according to their search, which is very helpful) never once cites any paper authored by Dr. Sherwood Idso, and he has authored plenty of them. Mr. Scholar...if you were a scholar you would know the proper term is "highly published" and/or "highly cited", not "highly credentialed" in any research field. There really are very few "credentials" in research fields. Ok, I apologize for not using the correct terminology. I have come across those terms, and Dr. Pielke, Sr. has published over 300 papers and is an ISI Highly Cited Researcher. I'll bet the last time Mr. Scholar's doctor told him he had a fever, he snapped back that he found a paper somewhere that told him he couldn't possibly have a fever. That he couldn't trust thermometers - just before he trotted into the fortune tellers tent to get an opinion he liked. That makes no sense. You'd have made more sense if you said authors of one paper found something different to authors of another paper on a particular topic. The IPCC would have presented both findings. I don't think you've read any of the IPCC reports, just as I don't think you've read much if any climate science. The IPCC reports present alternative findings where they exist, and present the science fairly as more conclusive or less conclusive. It's the most comprehensive collation of any science anywhere. Read one chapter of one the IPCC reports to get an eye-opener. Read the references and read the author list. You're piddly list of denier "publications" will then seem to you, well, piddly by comparison. Christopher Monckton aka the potty peer is a semi-professional entertainer and science denier. It's what he does. He's also a birther and claims to have found a cure for AIDS. He's partnered with others to get "papers" published in obscure "journals" of no repute as far as climate science goes. You might as well cite the Pattern Recognition journal or Energy and Environment or the Dog Astrology journal. 1. Why do you only like papers by the tiny number of science deniers and reject the 97%? 2. Which particular section or topic in the IPCC WG1 report have you read that you believe does not fairly represent the science? 3. What makes you think that the less than 3% are "right" and the 97% are wrong? "it's only warming a little bit"
"it is CO2 but only a little bit"
"it's not us, it can't be us, I won't have it, it's anything but CO2, it's not my fault, it can't be, I love my coal, I couldn't live without my petrol-guzzling car." Any or all of these dumb arguments. If a paper has Christopher Monckton's name attached it should raise a big red flag. Look out for the rebuttals - and take note. Same goes for Willie Soon, David Legates and WIlliam M Briggs. Look also at the impact factor of the journal. Look to see if the same journal has published any reputable papers on the subject as well as the disreputable ones. Deniers like Monckton try to argue that 3,896 is not 97.1% of 4014. They are wrong. It is. I don't blame you for not being able to assess the work itself, since from your comments you've made it very clear that you have no expertise in science or mathematics or arithmetic or any related discipline. However, one thing you can do is ask yourself why you have a preference for the tiny minority of papers. I do blame you for ignoring the experts and favouring known science deniers and contrarians. That signifies wilful ignorance and denial. It's wrong and you must know it. The bottom line is, since it's very obvious from your stream of comments that you know less than nothing about climate science, arithmetic or statistics, it would pay you to leave it up to the people who have devoted their adult life to studying these things. If you want to learn about climate then your time would be better spent learning about it, and not spent on denier blogs looking for reasons to reject 200 years of physics, chemistry and biology. Go get another hobby, like young earth creationism. Or join the flat earth society or the moon-landing truthers society, where you can find people who won't disagree with you. That remark about the fever is not true, and what I meant was that the IPCC concluded that it was extremely likely that more than half of the post-1950 warming was from human activities. Listen, those journals are all peer-reviewed and I don't care what you think about Monckton, read his papers and attack them, not him, ok? 1. The 97% "consensus" has been refuted in the peer-reviewed literature every time it has been claimed, at least with the well-known ones. 2. This: http://www.ipcc.ch/pdf/assessment-report/ar5/wg1/WG1AR5_Chapter03_FINAL.pdf. The IPCC cites Rahmstorf and Vermeer 2011, but fail to note reply to Rahmstorf and Vermeer's comment: http://www.bioone.org/doi/abs/10.2112/JCOASTRES-D-11A-00008.1. 3. I addressed this argument already. 4. Actually, the paper I cited was a rebuttal and I think anytime you cite SkS or your blog it should raise a red flag. http://onlinelibrary.wiley.com/doi/10.1111/j.1468-4004.2007.48118.x/abstract, http://www.fel.duke.edu/~scafetta/pdf/scafetta-JSTP2.pdf, http://www.scirp.org/journal/PaperInformation.aspx?paperID=3217, http://www.degruyter.com/view/j/spp.2010.1.1/spp.2010.1.1.1004/spp.2010.1.1.1004.xml, http://link.springer.com/article/10.1007%2Fs13143-014-0011-z, http://multi-science.atypon.com/doi/abs/10.1260/0958-305X.24.3-4.497, http://onlinelibrary.wiley.com/doi/10.1029/1999GL900303/abstract, http://link.springer.com/article/10.1007/s10509-013-1775-9, http://www.worldscientific.com/doi/abs/10.1142/S0217979213500732, http://www.sciencedirect.com/science/article/pii/S0012825215300349, http://www.ann-geophys.net/31/1833/2013/angeo-31-1833-2013.html, http://www.ann-geophys.net/30/9/2012/angeo-30-9-2012.pdf, http://academicjournals.org/journal/IJPS/article-full-text-pdf/64659D617030, http://www.atmos-chem-phys.net/10/1635/2010/acp-10-1635-2010.pdf, http://www.phys.huji.ac.il/~shaviv/articles/2004JA010866.pdf, http://www.phys.huji.ac.il/~shaviv/articles/20thCentury.pdf, http://www.sciencebits.com/files/articles/CalorimeterFinal.pdf, http://www.fel.duke.edu/~scafetta/pdf/2008GL036307.pdf, http://www.sciencedirect.com/science/article/pii/S1364682612000867, http://www.cdejager.com/wp-content/uploads/2009/02/2009-episodes-jastp-71-194.pdf, http://ruby.fgcu.edu/courses/twimberley/EnviroPhilo/Avery.pdf, http://arxiv.org/PS_cache/arxiv/pdf/0804/0804.1938v1.pdf, dx.doi.org/10.4236/acs.2014.44066, http://www.scirp.org/journal/PaperInformation.aspx?PaperID=27382. My attempts at constructive engagement with you and others have failed. You have consistently attacked me, the people I cite, you have not answered the question I posed twice, and you have not retracted your statement about Dr. Curry. Therefore, I must bid you adieu and we must agree to disagree. I am sorry this conversation turned out this way. OMG. Mr Scholar tells us the 97% consensus papers have been refuted, using an argument from assertion. They have not been refuted, Mr Scholar, *especially* if you in the follow-up comment manage to suggest RV11 was rebutted by the reply of HD11. You then provide a long list of links to papers, which include papers in known predatory publishers like SCIRP and academic journals, papers that have had strong rebuttals (Akasofu's "recovery from little ice age", for example, albeit the rebuttal was to a follow up to the paper you cite), and a *lot* of the rest in bottom-feeding journals or journals where climate is not the area of expertise. Mr. Scholar even manages to cite the first CLOUD paper (and Kirkby's self-published original argumentation to set up CLOUD), which in essence concluded that no conclusions could be drawn from their first experiments regarding potential cloud seeding by GCR (and besides that, the link between GCR and climate change has already been refuted, even by Svensmark himself - although he will not tell you this. Svensmark looks at anomalies around a trend, a trend he removes and does not explain. In one of his many papers I read some years ago, that trend was a whopping >2 degrees per century!). You might recall how John McLean wrote that appalling paper where he removed the temperature trend to announce there is no trend. And how he predicted that 2011 "will be the coolest year since 1956"! He's a denier from way back. I looked at a paper on the pop tech list (a while ago) and it was simply a letter from a doctor to a scientific journal complaining that continued talk of imminent climate change was upsetting his patients. Mr Scholar doesn't know if he's coming or going. As he indicates, he rejects mainstream science. (He also denies that he gets his denial from denier blogs, which makes him a denier liar.) He's an "anything but CO2" person. He's a big fan of Nicola Scafetta and Nir J. Shaviv, but he can't decide if "it's the sun" or "it's cosmic rays" or both. I expect he doesn't know that the temperature and TSI diverged a few decades ago. That is, the sun is less active now than it was earlier last century. Even if galactic cosmic rays (GCRs) made a big difference in cloud cover (which is unlikely, based on the CERN CLOUD experiments so far), there should be more of them now, which would suggest cooling. Less solar activity means a weaker solar magnetic field, which means more GCRs reaching Earth, which hypothetically means more clouds and less warming, not more warming. Yet the world keeps on getting hotter and hotter. The above is based on Svenmark's hypothesis that when high solar activity lowers levels of cosmic rays, that in turn reduces cloud cover and warms the planet. Depends on where the clouds are. Low level clouds have a net cooling effect, while high level clouds have a net warming effect. His reason for rejecting the entirety of the IPCC report is because, although the IPCC referred to Houston and Dean 2011, it didn't refer to their reply to a comment on their paper. The comment had nothing to add to their original paper, so it seems a paltry reason to reject the most comprehensive report of climate science ever. I guess he just wanted an excuse. He could just as well have argued that it didn't cite WUWT. He didn't answer my questions about why he rejects mainstream science, preferring to defend the potty peer and promote his lies about science. Mr Scholar, you've already said goodbye a few times. You didn't answer all the questions I put, and are merely continuing your denial. Enough is enough. HotWhopper isn't a notice board for you to write whatever silly thoughts happen to pop into your head. Try WUWT since you don't want to read or discuss real science. Dr. Scafetta and Dr. Shaviv are "highly represented" in the peer-reviewed literature, and Dr. Shaviv is on the editorial board of Scientific Reports. 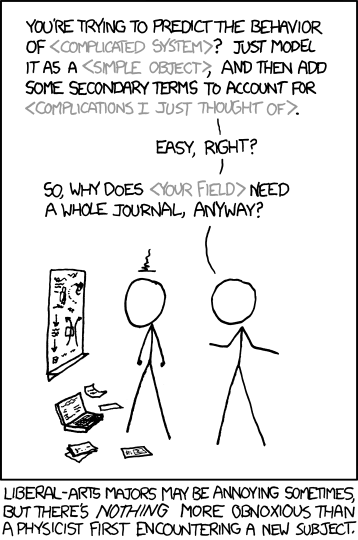 Scientific Reports is a predatory journal, not a reputable publication. I simply told you something that was unfair and I do not reject the entirety of the IPCC reports. Your "opinion". It was the dumbest example ever. As I said, you might as well have said that WUWT wasn't cited. Listen, I just gave you papers, ok? I didn't say they were representative of my views. Then why did you provide that ragtag collection of mostly science denial? No don't answer that. Your comment will be deleted unread. Any distortion of views is yours alone. I addressed your points, and I do know TSI and the temp diverged a few years ago, but as Dr. Shaviv pointed out, THE EFFECT OF THE SUN IS MORE THAN JUST TSI. Oh, are you a fan of Force X and the notch? The CERN CLOUD experiments have actually produced some evidence for nucleation. Yes, but no evidence so far that in the real world, they nucleate clouds AFAIK. For the umpteenth time. This time for good. "Dr. Pielke, Sr. has published over 300 papers and is an ISI Highly Cited Researcher"
One has to be very careful in interpreting the nature of citation counts. A familiarity with the nature of an author's work can be a great help in this, and if one does not understand why there are issues with unquestioning reliance on cite numbers, a perusal of papers by MacRoberts and MacRoberts may enlighten. It's the Nature version of PLoS One: we publish anything, as long as it is scientifically correct and you pay. Sou that was in reply to you first comment. And my explanatory comment makes no sense because it is out of order. Did you see what Roy Spencer said on his website? Blimey! "Since 2016 should be warmer than 2015 with the current El Nino, there is a good chance 2016 will end up as a record warm year…it all depends upon how quickly El Nino wanes later in the year." I don't want to call it just yet. But sooner or later the satellite data warming trend is going to re-emerge out of the noise. I wonder how the Deniers will spin that one? "I wonder how the Deniers will spin that one?" That's easy. 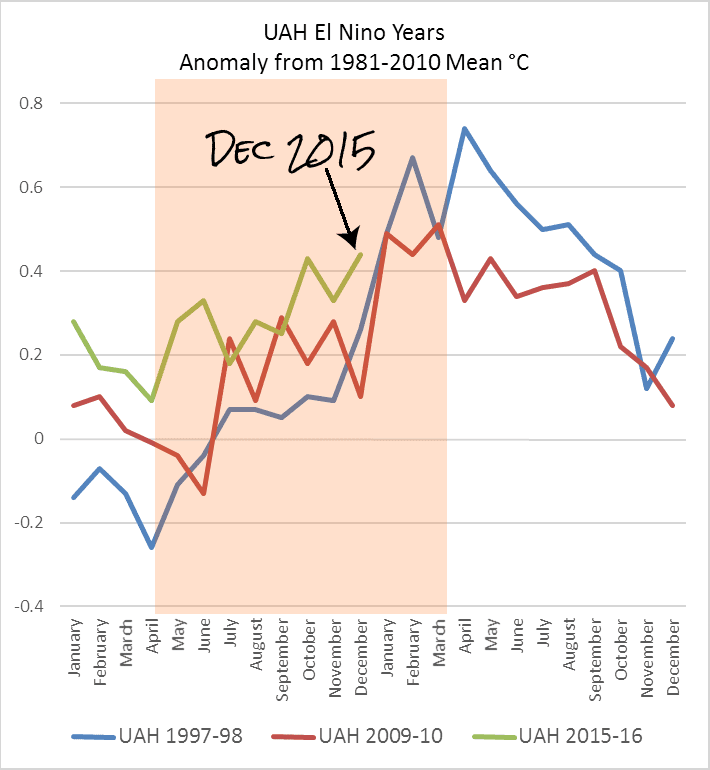 El Ninos only skew things when they are on the right side of a graph. When they are on the left, that's "natural". By changing their talking point again. I'm still hoping that one day it will turn out that Patagonian Permafrost will be the 'one true metric'. About a year ago I decided that those presenting a poor argument using the usual denier talking points merited a single neutral response, just to see whether they were open-minded and arguing in good faith, but simply badly informed. If after that the nonsense continued, it was DNFTT. Of course, people are entirely free to use whatever approach they wish. But remember it takes more work to refute gibberish than it does to generate it.